Sway away everyone with your simplicity by adding a unique charm to your ethnic look. This suit is crafted from lawn cotton which is a lightweight, breathable fabric with a smooth texture. It is soft and wonderful to wear so it is perfect for summer clothes or for regular wear in hotter climates. When tailored in regular fit, this suit set will keep you comfortable all day long. This is an unstitched dress material which has some fascinating design on top which comes with simple bottom and dupatta with resham border. 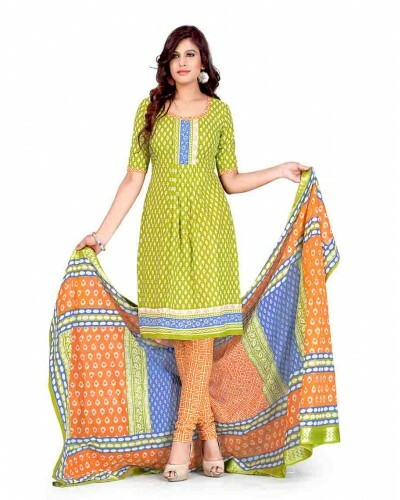 A Fabulous stuff to add in your wardrobe and showcase your desi look. You can also surprise your partner on the next date by wearing our ethnic suit.Top -2.20 meter of Cotton jaquard, salwar- lawn cotton 2.20 meter, dupatta- resham boader 2.20 meter.